Is your German Shepherd Dog aggressive? Aggression, to the desirable extent, is a part of the breed's natural character, although these dogs usually make great companions for your family and can prove to be quite good with kids. Too docile nature of German Shepherd will compromise his guarding and protective instincts, and would make him undesirably friendly with strangers, which is a serious fault in his character. While, on the other hand, too aggressive nature can be a way to get over you... that is to become the alpha member of the pack. His over aggression can be a challenge thrown towards you to acquire the alpha position. Do not surrender your position to your dog. Successful and technical dog ownership demands you to be the leader of the pack. It is only if you are the alpha of your pack, that you can be successful in your attempts controlling your dogs. Retaining the alpha position of the pack doesn't mean you will yell at him. Remember... Yelling, punishing and hurting him doesn't work. Beating him or punishing him will cause fear-based aggression. Aggressive dog training, be it with German Shepherds or for any other breed, involves correcting measures without punishing him. Yelling and punishing your aggressive German Shepherd Dog will simply stimulate your dog's fear and increase his aggression. Many people have been mailing me asking for suggestions about their aggressive GSD. Most of them have more than one dogs and they fight when they get to meet together. Sam's problem iss that his GSD tends to attack fearlessly his Labrador when they are given food at the same time. His trainer asked him to feed them separately. He said, now he has to pay double the charge paid to the one who walks his dogs, because he has to walk them separately. But this is not permanent solution! I am sure most people cannot afford to keep their dogs closed separately. 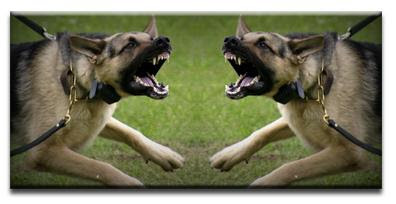 Find out why your dogs are aggressive towards each other. Did you not socialize them during their puppy hood? Or do both of them need dominance? If you did not have socialized them properly, it was your fault. If they both are fighting your dominance, it's again your fault. Dogs are quite intelligent,. and can learn things throughout their life. take them to the external world. Allow them meet situations, and experience strangeness of the nature. I would suggest you take both your dogs together - and take them in an entirely new area, where they have never been to before. Strangeness of new places will mitigate their aggression towards each other. In a new area they won't be claiming their territory and position, because they know they are new there. Each of your dogs will need one another to form a team there. Well, by this I mean to say their sense of lack of confidence in a new place will make them look for each other's company. Make them play... let them be dead tired. Next step is simple for experienced, but may be a bit tough for new owners. Bring them home and now do not lock them in separate places. Take them along with you in your hall. They are tired, and need rest now. Make them lie in the same hall at two different corners. Provide them water in separate bowl. Be there yourself; keep an eye on both and try to maintain your position as an alpha of the pack of three - you and your two dogs. Do not too soft will giving them command. Say "NO" firmly, whenever required. Don't allow them to get on you. Love them - but do not demonstrate preference - neither Rover over Rolley nor Rolley over Rover. The slightest demonstration of preference one over the other will make the other jealous, which will stimulate his aggression. Both of them should exercise together until they are tired. They should get the equal share of you love and touch. The aim is be at diminishing their jealousy towards each other. Pituitary dwarfism in German shepherd dogs is a rare kind of autosomal, recessive inherited disorder. This condition is irrepairable and is characterized by the lack of growth hormone, thyrotropin, prolactin, the gonadotropins and undeveloped pituitary gland. Although these hormones are not secreted properly, yet corticotropin secretion remains unaffected, which leads to dwarfism in GSD. Researches have been carried out throughout the world, on Pituitary Dwarfism in German Shepherds. Studies have shown that mutation of a gene encoding a transcription factor which is responsible for precluding the expansion of pituitary stem cells after differentiation of corticotropic cells may be the probable cause of Pituitary dwarfism in German shepherd dog. Treating this condition is almost impossible, but identification of the specific mutation will help in a DNA test for potential breeding dogs. Selective breeding may erradicate the problem. Pituitary dwarfism recessive inherited abnormality. Some of the highly scientific genealogical investigations have been carried out that indicated that the origin of the recessive gene is a mutation which had occurred at about 1940 or may be even before 1940s. Researches have indicated that many winning dog have been reciognised to be the carriers of this genetic condition. The genetic defect causing congenital GH deficiency in German Shepherd Dogs may be the probable cause of Dwarfism in other breeds like Carelian Bear Dogs and Saarloos Wolfhounds. Well this may sound a bit unrealistic, but as a matter of fact the pituitary dwarfism in Carelian Bear Dogs and Saarloos Wolfhoundshad been recognized for the first time after the German shepherd dogs had been used in breeding the later breeds. Selective bearding is recommended in order to steer clear of undesirable traits and genetic issues in the breed. Learn more about Dwarfism in German Shepherd Dogs. Howdy buddies??? How's it going? Here is an announcement about my website www.aboutgermanshepherddog.com. I have been awfully busy in resolving certain very serious problems related to my website About German Shepherd Dog. I have a dream with this website and that is too make it one of the world's largest online GSD resources. With this in mind I created this website that is run by a team of genuine GSD people, including vets, trainers, highly experienced owners, GSD breeders and pet writers and editors. I have been working too hard and have been researching more on the breed with my team so that I (We) can share our knowledge, discoveries & findings and news regarding the breed. I hosted this site with a hosting company (Featured Host - a fake branch of Websys) in India, after purchasing the domain through this company owner (Arindra) from Hostgator. After running this site for over a year or so, I was surprisingly shocked to discover that About German Shepherd Dog has been allotted a hosting space that is way less than what this man was being paid for. Jeff - my friend - one of my team members (a GSD enthusiast and researcher for around 15 years now and a pet writer, who writes about the breed) had repeatedly asked me in the past two general meetings to get the domain control from that man - the owner of the hosting company. I asked for it, but he denied to give me that. He refused to increase the hosting space, and told me that the money which he was being paid was agreed upon at the beginning verbally. I realized that he was a fraud. My site was attacked by dangerous malware that was in his server, and was off for around a month - flashing out a message that "Your Account Has Been Suspended". During the renewal of the domain (in the year 2010) I had paid him in advanced, yet he did not renewed it on time and the site went off again for around a month. All these made us gripped into pronged pressure, because About German Shepherd Dog had already marked its name across the web. I found no other alternative, but to drop down to the court of law. I told him what was I going to do if he refused to provide with desirable services, and the next morning I found 65 most important pages were missing leaving behind only as few as 42 pages. He could track my admin details from cpanel. Finally, I took serious measures and have saved About German Shepherd Dog. We have changed our host and transferred the domain. Even after going through a series of such awful phase, About German Shepherd Dog is still on the first page on Google for the major keywords. Its a re-birth for the site. Everybody in the About German Shepherd dog team can now enjoy a peaceful sleeps in nights. Beware of fake companies like these!